I've received a couple e-mails lately with people asking about the different ways to setup attributes in a Dynamic block. Especially attributes in a Dynamic block with visibility states. So there are two different types of attribute situations you can setup in your block. The first option is, you edit an attribute value in one visibility state and all visibility states attributes are affected and show the same value when active. So you could have an attribute that says "Manufacturer" and change that value and affect all visibility states if all visibility states are from the same manufacturer. The second option is have different attributes for each different visibility state. For example if you have that Manufacturer attribute you can have a different manufacturer value for each visibility state. 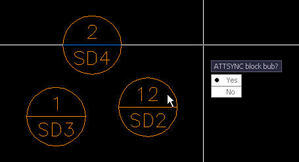 The second option you will need to copy your attributes to each visibility state you want it to show in. Next, change the identical attribute tags so no tags are alike. I usually just append a 1, 2, 3 or A, B, C to the end of the tag. If the Tags are identical the block will get confused. This is a really confusing subject so hopefully this sheds some light. You can also download the attached sample file to better explain it. Do you get sooo frustrated when you see you're users EXPLODING your nice Dynamic blocks? Yes, there is the option that allows you to specify which blocks can be exploded. But face it, sometimes you have to. There is options where a block needs to be a totally different layer, or color or linetype. I run into this all the time. But I may have a solution for this. If you use the attached code called MAKE0, it prompts you to select a block, dynamic or not. It will next take that block and create a block with the same block name but with the extension -0. Then change all the objects in the block from its current layers and settings to layer 0. It will erase the old block and insert the new block in the same location. Once placed, the block will get the same settings in the currently set layer for the drawing. Allowing you to change the appearance of you blocks without having to explode them. Here you select the block. Next your block will get the current layers properties applied to it. Now your block is still a block and will change as you change its layer settings. Here the block changes as you change its current layer. Note: Dynamic blocks wont be set back to their dynamic block states. It will act just like a reset. You will also notice a quick flash when the code enters the dynamic block editor. This is needed to retain the dynamic block properties. Just saw this on one of the Autodesk Discussion forums. DG CAD has provided 5 videos, all free to download of Dynamic block tutorials. The videos although are around 100 mb each. I have not checked them out, but feel free to leave comments here on what you think. I'm going to try and download them tonight to check them out. I'll comment back on what I think. I've been debating on writing some tutorials and videos myself, but not sure if people prefer step by step tutorials or videos? Most the time, videos or tutorials never really apply to the discipline I'm working at? But I guess a general all around aspects are nice. Lesson 5: Visibility Parameter, Linear Parameter, Scale Action. When converting you're old legacy blocks to Dynamic blocks, you may have noticed some problems with your dynamic blocks. Especially blocks that contain existing attribute data information. The main problem happens when you try and redefine an existing block containing attributes, with a new Dynamic block with locked attributes. This causes the blocks attribute grips to show, and not be locked in all existing occurrences of the block. So you're legacy blocks attributes wont work when being redefined. Now I've heard some people are going around erasing their old attribute blocks and re-inserting the new Dynamic block. Others are leaving the old blocks as is, and newly inserted blocks will have the dynamic properties, that work on the attributes. An easier method is simply use the ATTSYNC command. This command allows you to SYNC or update all instances of a selected block with the current attributes defined for the block. So, it will quickly update all your old legacy blocks with un-locked attributes to locked attributes. Making them work in your dynamic blocks again. Another command you can use is the express tools BATTMAN. There is a SYNC button contained inside there. Below is some images to better explain. Here is an image of old legacy blocks with un-locked attributes. This image shows existing regular blocks once redefined by a Dynamic block. Notice the Dark blue attribute grips show along with the light blue Dynamic block grips. This shows the prompts for ATTYNC. Specify YES to process your blocks in the drawing. This process needs to be done on each different block name that you want to update. Once ATTSYNC is completed, all your existing blocks with that block name are now updated to locked attributes and your Dynamic blocks should function normally. Does your Dynamic block have duplicate attribute entries? And you need to update one, and have that automate to others attributes in your block? Well you can. All you need to do is create a lookup table inside your Dynamic block and fill in some attribute values in the lookup properties column. Once you've filled in all the lookup pretties for your block, you need to add a blockplaceholder field inside each of your attributes. Then point your blockplaceholder field to this lookup table you just created. Then that's it. Now when you insert your block, you can select your lookup table grip and modify all your attributes at once. Now this system works good if you know what your values are going to be every time. If your values change like a grid system, where you may have grid line 11.7 or BB.6. Its a little overkill to try and add every possible value in. But this works good for simple values like the example I have below. Now I understand this work around may not be what everyone envisioned AutoCAD to do. But works with the tools we have, without having to punch out some code. Here create your Lookup table or attribute entries. Here path in your blockplaceholder field to the lookup table you just created. Now select your lookup table you created and change your value. Then both attributes will update upon regen. Face it, we all need it! Cut symbols are used all the time. Now the tricky part is how to get it in your drawing? How to manipulate it for scales, and what it looks like. Well I decided to punch out some code that could help 2 of these 3 problems. 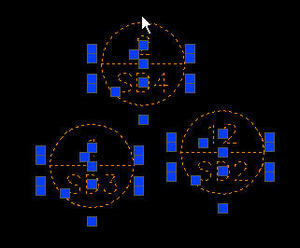 Attached is a Lisp code I wrote to allow a user to pick 2 points and place a cut symbol. Now whats cool about this cut symbol is its a dynamic block. It has grips on each end to always keep the cut symbol centered. Or if you need it to be slightly to the right or left you can do that also. The Dynamic block is also tied in with the code so if you pick two points really close you will get a straight line cut. This way not cluttering up your drawing. I've attached a couple sample cut symbols you can test with. But feel free to take these couple blocks and expand upon them for your office standards. To test and use the Dynamic Cut block. Simply issue APPLOAD and load the attached Lisp code. Then make sure the dynamic CUT block called "CUT" is in the drawing. Then just run the command "CUT". If you need the scale of the CUT symbol bigger just change your DIMSCALE. The Cut symbol will scale up as you change Dimscales. 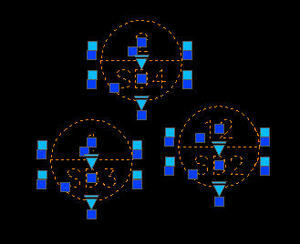 If you have some cool cut symbols you'd like to share with others feel free to e-mail them to me. By sending them to me you agree that the blocks can possibly be posted on this blog for others to access. The Dynamic blocks white paper series has been completed. Part 3 of 3 has been released and has many good explanations on Dynamic block usage, parameter naming and conventions. Thanks Ellen for the great work, of this 3 part series! !